Providing a safe and effective environment to all who practice, gentle yin yoga classes are usually easier and less intense than most classes offered today. These classes are great for beginners who are testing the yoga waters. Many people who practice yoga consider gentle yin yoga to be non-strenuous and more meditative than other classes they have attended. Those with a limited range of motion or those who find themselves very stiff. Chronic condition suffers – especially those who suffer from arthritis and back pain. People who are recovering from a surgery or injury. Gentle yin yoga has also been known to help with stress-reduction and weight loss. It has helped in reversing heart disease as well as provided relief for the more challenging condition such as fibromyalgia and chronic fatigue. Many mood disorders have also been relieved by practicing gentle yoga. What is Gentle Yin Yoga Like? Many practitioners describe a gentle yoga class as a softer and more relaxing session. It is very slow-paced with a lot of support from the other attendees as well as the teacher. Movements are carefully orchestrated and stretches are to be well-measured. There should also be a wide range of motion exercises. Teachers should allow the students to increase their postures in gradual steps allowing plenty of time for breathing. During this nurturing session, students should be encouraged to make step-by-step movements. Repetition is important to make the steps easy to remember. All gentle yoga classes should be inclusive of all who wish to practice. Many refer to this type of yoga as “accessible yoga”. For students who don’t have a great range of flexibility or strength, this is the best option. If you are feeling discouraged or scared to start yoga, try beginning with gentle yin yoga. This class will provide you with a safe and compassionate environment you can’t find anywhere else. 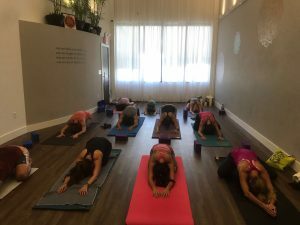 Nobe Yoga answers the question, “where can I find yoga near me?” Located in Miami Beach, Nobe Yoga’s studio provides students and teachers with excellent resources to excel in their practices. Complete with a juice bar inside, the studio has a wide variety of yoga classes daily. If you’re looking for gentle yin yoga, Miami Beach, don’t search further than Nobe Yoga!